Since being diagnosed with Asperger’s as an adult, I have learnt plenty about myself and become more self-aware of my own behaviours. 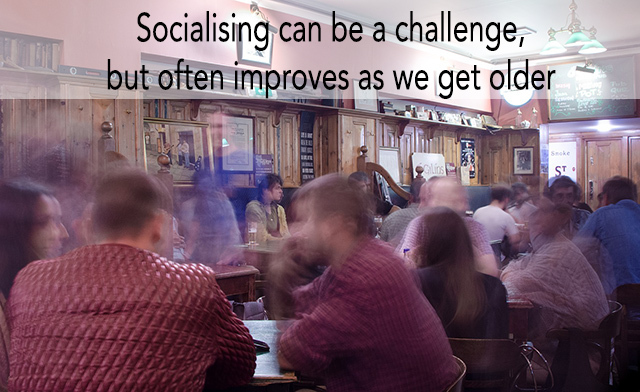 In particular, I have learnt and understood a lot more about myself in social situations. My extra awareness doesn’t solve all the difficulties I can face in certain situations, such as being with large groups of people and reading body language. However, it is easier for me now compared to when I was a child and unaware of my condition. At school, I was pretty shy and had difficulty making friends and fitting in and when I did try to come out of myself, I could often appear strange to others. It was fortunate that I was passionate about playing and following sport and this helped me to make a few good friends who shared similar interests to me, like football for example. It’s only looking back now that I’m more aware of what I struggled with in social interactions as well as what I felt at ease with. I struggled with first impressions because I was shy and not comfortable with making eye contact with unfamiliar people, and had difficulty reading facial expressions due to my autism. However, when I get to know a person and when they get to know me, I feel more comfortable with them. I am a good listener and quite honest, so while haven’t had large groups of friends, the people who I am friends with have found me trustworthy and someone they can talk to. As I have grown older, I’ve improved my social skills. For example, I am more aware of looking someone in the eye and smiling when making a first impression. Also, I am more confident in contributing to conversations in groups. When interacting with friends and family, I can sometimes talk too much about myself and forget to ask them questions, for example ‘how has your day been?’ However, I have become more aware of the importance of making small talk as well as showing a keener interest in the other person during conversations. I was diagnosed with Asperger’s six years ago and it has taken some getting used to. Now I am grateful for the diagnosis because it has helped me to understand more about myself and why I think and act the way I do. Could you share where in NSW you got the help as an adult to cope in Social situations?